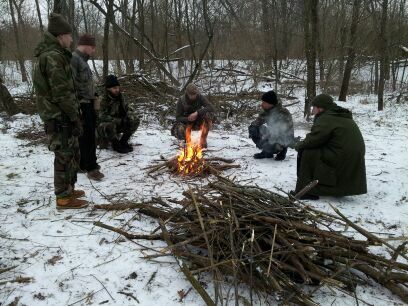 Please contact us at: schoolofselfreliance@outlook.com to inquire about upcoming survival or prepper classes. You can also visit our website at: http://schoolofselfreliance.webs.com/ for even more classes not listed here! -What is Food Storage? Why do I need to store food and water? -What can I store and what can I not store? School of Self Reliance http://schoolofselfreliance.webs.com/ Find us on Facebook! Participants 15 through 18 must have a paying/participating adult to attend. Children under the age of 15 are not advised for safety reasons. WE ALSO OFFER GROUP RATES! CONTACT US TO FIND OUT ABOUT DISCOUNTS FOR GROUPS OF 10 OR MORE! It does not kill mold. It is not 100% effective against Giardia, but darn close. Use white vinegar to kill mold. 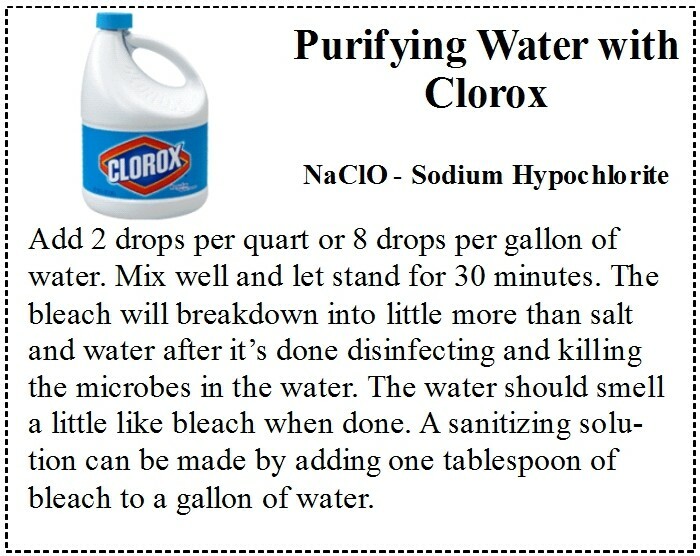 Info courtesy of Clorox.com and the CDC in Atlanta, GA.
Short of using a very high-quality water filter, this is the most reliable method for killing microbes and parasites. Bring water to a rolling boil and keep it simmering for at least several minutes. Add one minute of boiling to the initial 10 minutes for every 1,000 feet above sea level. Cover the pot to shorten boiling time and conserve fuel. The flat taste of boiled water can be improved by pouring it back and forth from one container to another (called aeration), by allowing it to stand in a closed container for a few hours, or by adding a small pinch of salt for each quart of water boiled. When boiling is not practical, chemical disinfection should be used. Common household bleach contains a chlorine compound that will disinfect water. The treated water should be mixed thoroughly and allowed to stand, preferably covered, for 30 minutes. The water should have a slight chlorine odor; if not, repeat the dosage and allow the water to stand for an additional 15 minutes. If the treated water has too strong a chlorine taste, it can be made more pleasing by allowing the water to stand exposed to the air for a few hours or by pouring it from one clean container to another several times. Without water and electricity, even everyday tasks are tough. In lieu of steaming hot water, sanitize dishes, pots and utensils with a little Clorox Bleach. Generic Bleach is fine as long as it is 1%. Only use Regular Clorox Bleach (not Fresh Scent or Lemon Fresh). To insure that Clorox Bleach is at its full strength, rotate or replace your storage bottle minimally every three months. If using old (or unknown age bleach)- double the recommended dosages of bleach. Iodine tablets, such as PotableAqua™ – (50 tablets per bottle) two tablets treats a quart of water and are effective against Giardia lambia. Tincture of iodine: If you have no iodine tablets but have liquid iodine such as would be used to treat a wound, (typically this is a 2% tincture of iodine) try a teaspoon of iodine in a gallon of water. In granular formation, this chemical is used to clean the water in pools and hot tubs. In a pinch, you can use it as part of a two-step process to purify drinking water. 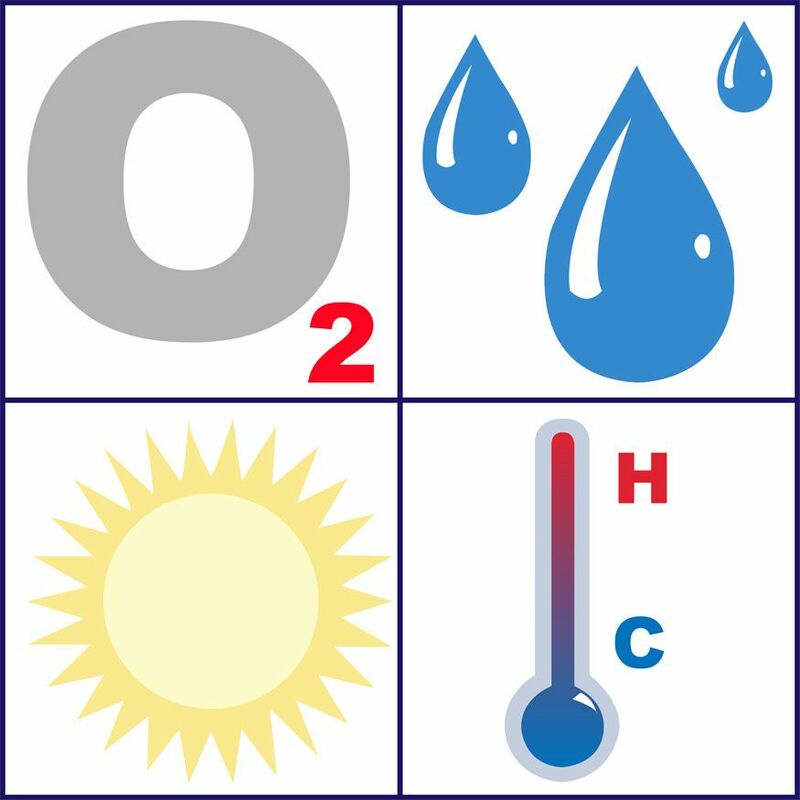 First, you dissolve the calcium hypochlorite in a smaller amount of water to create a hyper-chlorinated solution. 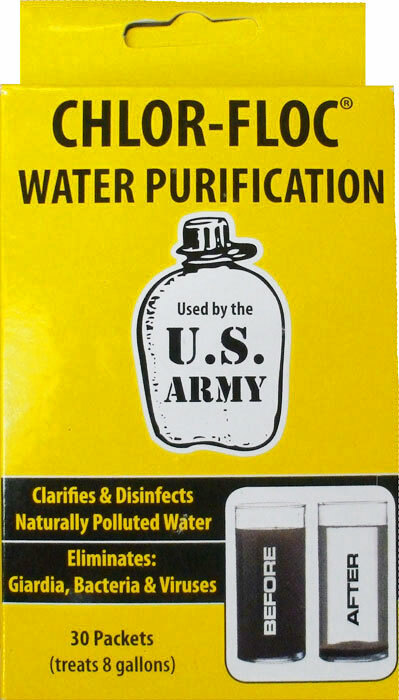 The U.S. Army Center for Health Promotion and Preventive Medicine suggests using a heaping tablespoon of calcium hypochlorite in 2 gallons of water. Once it’s dissolved, that solution can then be added to your main supply of water to disinfect it. The suggested ratio here is 1 part chlorine solution to 100 parts water, or use it like normal Household Bleach at this point, using the disinfectant ration above. Typical wait time before drinking treated water is at least 30 minutes from the time that the treatment tablet has become fully dissolved in the water. 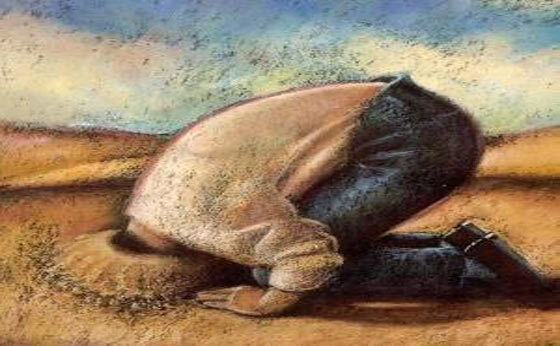 The necessary time could be longer. Water temperature should be 65 degF or higher before treatment with bleach for best results. You may be able to warm your water by placing it in the sun. If the water is below 40 deg.F. you should double the wait time before consuming it. Water temperature should be 68 degF or higher before treating it with iodine. Iodine is more effective than bleach in killing off Giardia contamination in water. Be sure to read the instructions. Iodine, bleach (sodium hypochlorite), or other water disinfectants will require some wait time to permit the chemical to act on water bacteria before the water can be consumed. Using any chemical to sterilize water will require sufficient contact time between the chemical and the water before the water can be consumed. 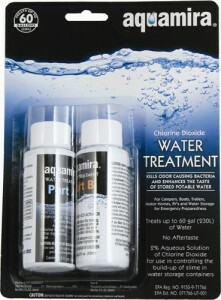 The chemical, bleach, or iodine, needs time to kill the microorganisms in the water. If you have iodine tablets intended for purifying water, the tablet bottle label should indicate the number of tablets to use per gallon of water and also the length of time that you must let the water sit before drinking it. If using liquid iodine to purify water, let the treated water sit for a day before using it to drink, if you can. If your water supply is very cold you will need to increase the wait time for the chemical disinfectant to act before the water can be consumed. If your water supply is cloudy you will need to increase the wait time for the chemical disinfectant to act before the water can be consumed. That’s why experts recommend filtering the water with a clean cloth first if you can. In an emergency you might also be able to use clean coffee filters or even plain white paper towels, or fabric like your shirt or socks, or a bandana.